I created this painting for the Art and Conflict show that dealt with the complicated issue of speaking about the devastation of war through art. 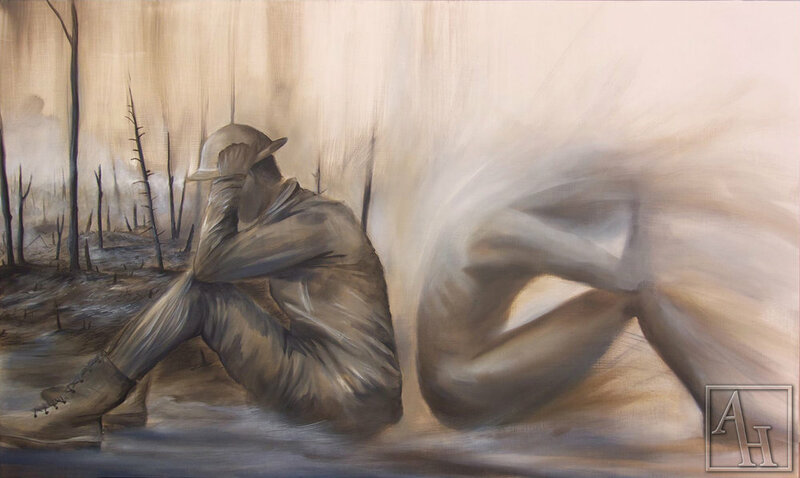 This piece deals with the psychological anguish that many soldiers have to endure during and after their deployment. Many people only think of the bodily sacrifice our soldiers make but many also suffer emotional and mental trauma that cannot be seen from the outside. This piece expresses a soldier losing the humanity that has lived in him for so long and the beginning of a long journey to recovering it once again. This is a painting about perseverance and how important it is for us to envision our future with clarity and optimism. It can be easy to remain optimistic about your goals when things are going your way but true character is built them adversity strikes and our dream is blocked, distorted or challenged. It is up to us to stay true to ourselves and remain stubborn and idealistic with our dream always out in front of us. *SOLD* This painting is dedicated to those who have left us. In some way we all leave a mark on this earth by living on it, our thoughts, decisions and actions all leave microscopic impacts that help shape the collective reality. When another life is completed they humbly return the body that they had borrowed and leave this reality. We feel the emptiness that is left behind but the ones we have lost will always live in our hearts with freedom. *SOLD* This new robot piece enhances the human nature of these robotic beings and shows that humanity can exist in the most unlikely places. When we have trouble understanding things that are different than us it is important for us to empathize and look at the world through their eyes. There are many things in this world that can seem strange or foreign and if we let go of our prejudice we can move forward with an open heart. This piece illustrates humanities connection to nature and how it is engrained into our identity. Our separation from nature is only as big as we make it. This piece explores the human ability to let go and be vulnerable with nature and allow it to comfort us and give us energy. The natural world exists with it's own ebb and flow and it can be beneficial for us to observe and learn from it. 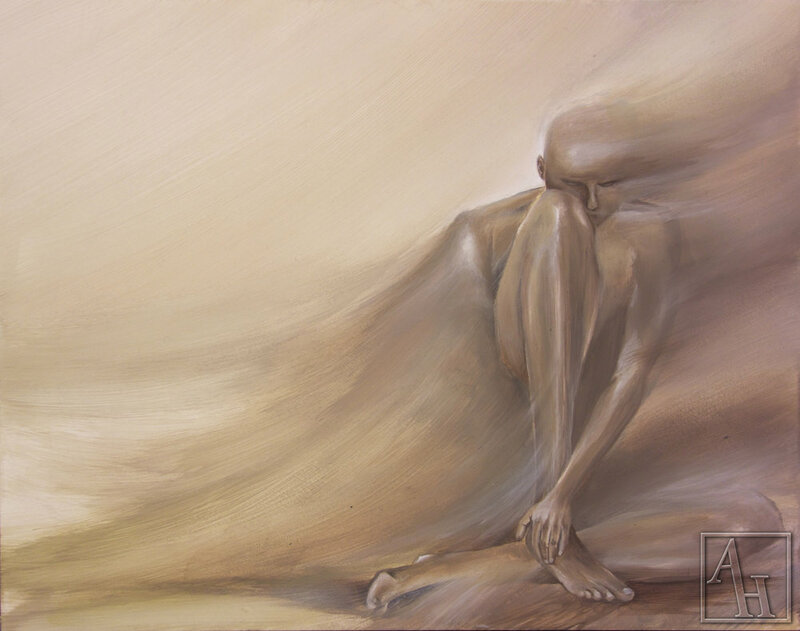 This piece illustrates an emotional emptiness that can be felt from loss. This emotional state can warp our surrounding landscapes and change how we perceive the world. *SOLD* This piece developed out of an earlier piece called Entangled because I wanted to create an environment for a figure to exist in. This person is protected within this abstract realm that can be seen as roots, water or branches. . This piece was a present for my girlfriend. In it I was trying to imitate the loose brush technique that I used in "Moment." I would say I completed this goal considering she did not recognize the figures until I pointed them out to her. *SOLD* I created this piece for Little Machine Brewery in Denver. In it, I wanted to portray human qualities in robotic forms and convey an emotional connection between the two figures. 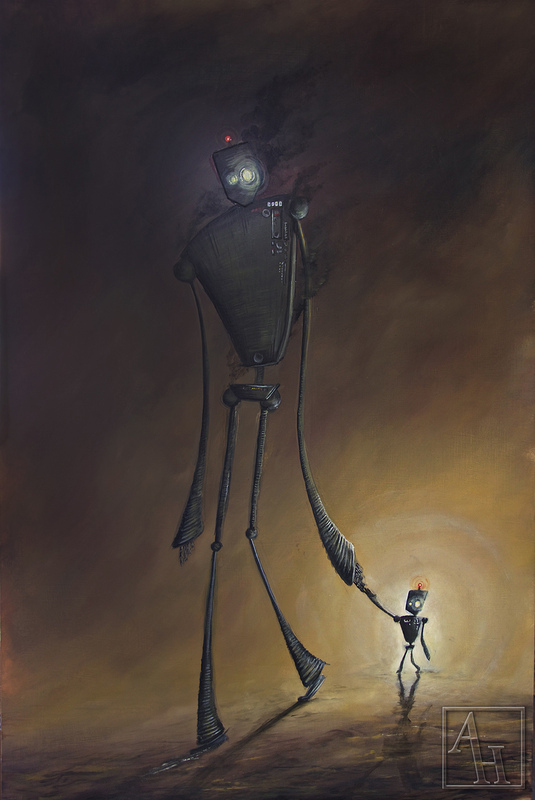 This piece is a continuation of "Robot Father and Son." In it i wanted to show more of the post- apocalyptic environment that these robots live in as well as a more urgent moment between the two figures.